Exmouth is a town on the tip of the North West Cape in Western Australia. Visiting Ningaloo Marine Park and Turquoise Bay will get you outdoors. Discover out-of-the-way places like Ningaloo Reef and Yardie Creek. 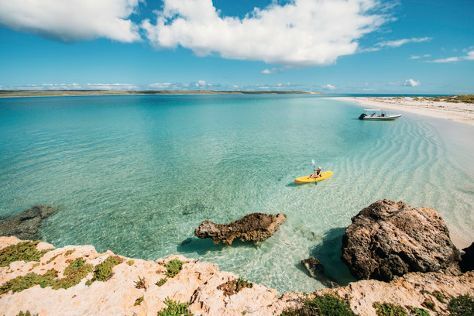 There's much more to do: meet some fierce fish with a shark diving experience, tour the pleasant surroundings at Ningaloo Coast World Heritage Area, and find your balance on the water with some of the best stand-up paddleboarding in the area. For ratings, other places to visit, and other tourist information, go to the Exmouth itinerary maker . London, UK to Exmouth is an approximately 30-hour flight. You can also do a combination of flight and bus; or do a combination of flight and car. Due to the time zone difference, you'll lose 8 hours traveling from London to Exmouth. Expect much hotter weather when traveling from London in May: highs in Exmouth hover around 33°C, while lows dip to 18°C. Finish up your sightseeing early on the 5th (Sun) so you can go by car to Denham. Denham is the administrative town for the Shire of Shark Bay, Western Australia. Get outdoors at Francois Peron National Park and Little Lagoon. You'll discover tucked-away gems like Shark Bay and Eagle Bluff. There's more to do: enjoy the sand and surf at Shell Beach and meet the residents at Ocean Park Aquarium. Getting from Exmouth to Denham by car takes about 8 hours. Other options: do a combination of bus and car; or do a combination of flight and taxi. Finish up your sightseeing early on the 8th (Wed) so you can go by car to Kalbarri. Visiting Murchison River and Chinaman's Beach will get you outdoors. You'll explore the less-touristy side of things at Kayaking & Canoeing and Kalbarri Pelican Feeding. There's lots more to do: take in the dramatic natural features at Nature’s Window, get great views at Island Rock & Natural Bridge, hike along Ross Graham Lookout, and admire nature's wide array of creatures at Rainbow Jungle. To find ratings, reviews, where to stay, and more tourist information, refer to the Kalbarri trip planner . Traveling by car from Denham to Kalbarri takes 5 hours. Alternatively, you can do a combination of shuttle, bus, and taxi. Cap off your sightseeing on the 11th (Sat) early enough to travel to Esperance. Esperance is a town in the Goldfields-Esperance region of Western Australia, on the Southern Ocean coastline approximately 720km east-southeast of the state capital, Perth. Relax by the water at Thistle Cove and Ten Mile Lagoon. Step off the beaten path and head to Blue Haven Beach and Salmon Beach. The adventure continues: tour the pleasant surroundings at Lucky Bay, view the masterpieces at Section Glass Gallery, kick back and relax at Twilight Bay, and stop by Mermaid Leather. 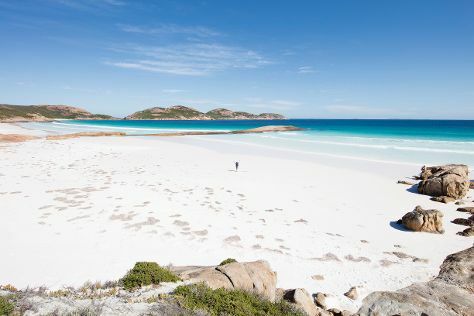 For where to stay and more tourist information, refer to the Esperance trip itinerary planner . Getting from Kalbarri to Esperance by combination of taxi, bus, and flight takes about 9 hours. Other options: do a combination of taxi, bus, flight, and car; or drive. Expect a daytime high around 22°C in May, and nighttime lows around 11°C. Wrap up your sightseeing on the 14th (Tue) early enough to drive to Albany. You'll enjoy a bit of beach vacationing at Cheynes Beach and Cosy Corner Beach. Eschew the tourist crowds and head to Elephant Rocks and Replica of the Brig Amity. Next up on the itinerary: enjoy the sand and surf at Little Beach, stroll through Emu Point, take in the dramatic natural features at The Gap and Natural Bridge, and pause for some photo ops at Desert Mounted Corps Memorial. To see maps, traveler tips, ratings, and other tourist information, read Albany trip itinerary planning tool . You can drive from Esperance to Albany in 5 hours. Other options are to fly; or take a bus. Expect a daytime high around 22°C in May, and nighttime lows around 10°C. Wrap up your sightseeing on the 17th (Fri) to allow time to drive to Margaret River. Eschew the tourist crowds and head to Surfers Point and Cowaramup Bay. You'll get in some beach time at Gnarabup Beach and Hamelin Bay. You'll find plenty of places to visit near Margaret River: Meelup Beach (in Dunsborough), Yallingup (Canal Rocks & Yallingup Beach) and Hamelin Bay Jetty (in Hamelin Bay). There's still lots to do: look for all kinds of wild species at Sunflowers Animal Farm, take a memorable drive along Caves Road, learn about winemaking at Saracen Estates, and look for gifts at Gabriel Chocolate. To find maps, traveler tips, ratings, and other tourist information, go to the Margaret River tour planning app . Traveling by car from Albany to Margaret River takes 4.5 hours. Alternatively, you can take a bus; or do a combination of flight and bus. Finish your sightseeing early on the 21st (Tue) so you can travel back home.